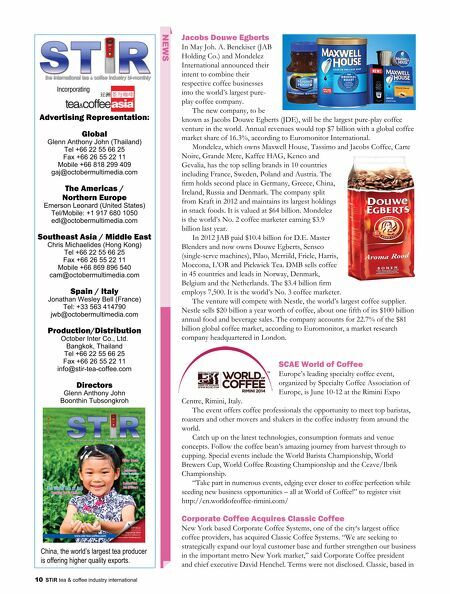 10 STiR tea & coffee industry international Jacobs Douwe Egberts In May Joh. A. Benckiser (JAB Holding Co.) and Mondelez International announced their intent to combine their respective coffee businesses into the world's largest pure- play coffee company. The new company, to be known as Jacobs Douwe Egberts (JDE), will be the largest pure-play coffee venture in the world. Annual revenues would top $7 billion with a global coffee market share of 16.3%, according to Euromonitor International. Mondelez, which owns Maxwell House, Tassimo and Jacobs Coffee, Carte Noire, Grande Mere, Kaffee HAG, Kenco and Gevalia, has the top selling brands in 10 countries including France, Sweden, Poland and Austria. The firm holds second place in Germany, Greece, China, Ireland, Russia and Denmark. The company split from Kraft in 2012 and maintains its largest holdings in snack foods. It is valued at $64 billion. Mondelez is the world's No. 2 coffee marketer earning $3.9 billion last year. In 2012 JAB paid $10.4 billion for D.E. Master Blenders and now owns Douwe Egberts, Senseo (single-serve machines), Pilao, Merriild, Friele, Harris, Moccona, L'OR and Pickwick Tea. 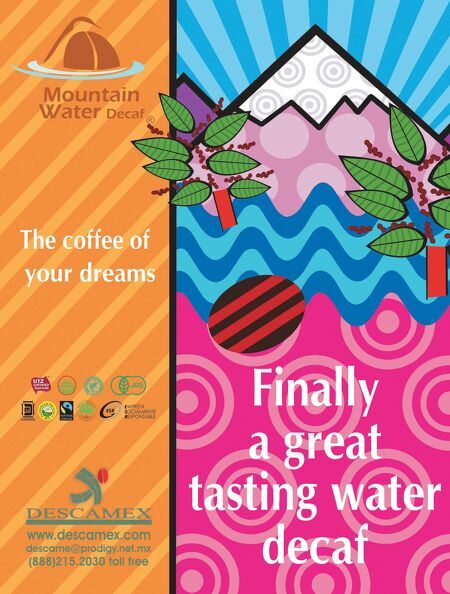 DMB sells coffee in 45 countries and leads in Norway, Denmark, Belgium and the Netherlands. The $3.4 billion firm employs 7,500. It is the world's No. 3 coffee marketer. The venture will compete with Nestle, the world's largest coffee supplier. Nestle sells $20 billion a year worth of coffee, about one fifth of its $100 billion annual food and beverage sales. The company accounts for 22.7% of the $81 billion global coffee market, according to Euromonitor, a market research company headquartered in London. SCAE World of Coffee Europe's leading specialty coffee event, organized by Specialty Coffee Association of Europe, is June 10-12 at the Rimini Expo Centre, Rimini, Italy. The event offers coffee professionals the opportunity to meet top baristas, roasters and other movers and shakers in the coffee industry from around the world. Catch up on the latest technologies, consumption formats and venue concepts. Follow the coffee bean's amazing journey from harvest through to cupping. Special events include the World Barista Championship, World Brewers Cup, World Coffee Roasting Championship and the Cezve/Ibrik Championship. "Take part in numerous events, edging ever closer to coffee perfection while seeding new business opportunities – all at World of Coffee!" to register visit http://en.worldofcoffee-rimini.com/ Corporate Coffee Acquires Classic Coffee New York based Corporate Coffee Systems, one of the city's largest office coffee providers, has acquired Classic Coffee Systems. "We are seeking to strategically expand our loyal customer base and further strengthen our business in the important metro New York market," said Corporate Coffee president and chief executive David Henchel. Terms were not disclosed. Classic, based in Incorporating NEWS Advertising Representation: Global Glenn Anthony John (Thailand) Tel +66 22 55 66 25 Fax +66 26 55 22 11 Mobile +66 818 299 409 gaj@octobermultimedia.com The Americas / Northern Europe Emerson Leonard (United States) Tel/Mobile: +1 917 680 1050 edl@octobermultimedia.com Southeast Asia / Middle East Chris Michaelides (Hong Kong) Tel +66 22 55 66 25 Fax +66 26 55 22 11 Mobile +66 869 896 540 cam@octobermultimedia.com Spain / Italy Jonathan Wesley Bell (France) Tel: +33 563 414790 jwb@octobermultimedia.com Production/Distribution October Inter Co., Ltd. Bangkok, Thailand Tel +66 22 55 66 25 Fax +66 26 55 22 11 info@stir-tea-coffee.com Directors Glenn Anthony John Boonthin Tubsongkroh China, the world's largest tea producer is offering higher quality exports.